Check out each of them and choose the ones you can fit in. The 2 most popular blogging platforms are blogger and wordpress. Check out 7 Things to Consider In Order to Build A Successful Blog/Website. Once you have setup a fully functional blog, the next idea is how to monetize your website or blog. There are many ways to monetize your blog. One of the main ways of monetizing your blog is to sign up with different affiliate companies. In affiliate marketing, you allow advertizers to place their adverts on your website or blog. When people buy their products or visit their product page through their ads on your blog, they pay you some money. The most lucrative affiliate marketing programs are those that pay you per click on their ads. Google adsense is one of the Pay Per Click (PPC) affiliate programs. Before you can get an approve Google adsense account, there are some standards that that your blog or website must meet. Check out How To Get An Approved Google Adsense Account And Why Your Previous Applications Were Rejected. There are other affiliate programs that can also fetch you cool cash and also help you monetize your blog like amazon and ebay affiliate programs. These two affiliates are the most popular and the largest ecommerce websites. I revealed The 5 Recommended Affiliate Alternatives To Adsense. Some of the popular websites that offer web design tutorials are linda.com, simpletut.com, etc. You can also learn web design offline from a friend or from some computer and web design institute in your locality. When you design and maintain a blog or website for your clients, they pay you and you make cool cash. This is one of the trending ways to make money online as a programmer. When you design an android app, you upload and advertise it on some platforms like Google play store and make your money when people download it. You can further monetize your apps by embedding ads like Google adsense ads. When your app users click on the ads, you earn money. There are also some online websites that provide android app development tutorials. This is also one of the latest and trending ways to make cool cash online. You can make money by uploading your videos on youtube and signing up for youtube adsense which is easier to get than website or blog Google adsense. Google embeds some ads on your videos. When viewers click on the ads, you earn money. Writing and publishing books online is another lucrative way to make money from the internet. It saves you the money you would have used to pay printers and publishers if you were to publish it offline. Also, since most people prefer to read ebooks to hard copies, your books tends to reach to more customers and you make more sales and money. You can write and publish fiction novel, tutorial books, recipes and cookbooks, etc. There are many online book publishing platforms that help you self-publish and advertise your book online like amazon.com, createspace.com (for publishing paperbacks), bookbaby.com, etc. The most recommended self-publishing platforms are amazon kindle self-publishing platform that allows you to publish your book without any initial charge. They also pay you up to 70% of your book sales as royalty. Check out one of my articles on how to self-publish on amazon kdp. I self-publish on amazon kdp myself. Apart from book publishing, you can also sell your products at amazon.com. All you need to do is to create a free amazon seller account and setup your products. Amazon markets your products and also pays you. Online article writing is also another lucrative way to make legitimate money from the internet. If you a good writer, you can write articles for some educational websites and get paid. You can also write articles for big blogs or websites and submit as guest post and also get paid especially if you are promoting their products. 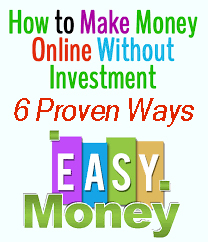 I explained up to 6 trusted and legitimate ways to make money online. Try out the ones that tickle your fancy and make cool cash from it and also become self-employed. There are other ways to make money from the internet but these are the 6 most lucrative, tested and trusted ways to make cool cash online. I know you have some suggestions and questions on how to make money online for free. I will glad to hear it in the comment section below. Extremely informative. Thank you for sharing! I'm a fairly new blogger but my goal is to definitely turn this into a profitable line of work. Great tips you have there. You can earn money in e-commerce dropshipping too.